Discussion in 'Football Forum' started by van der star, Jul 10, 2018. Think he meant "home, we smash them". Has to be Rio or Evra. They always tell us story about Ronaldo. You have to be a self absorbed narcissist to be as good and as dedicated as he is to anything. A normal person can't be this bothered about being this much of a perfectionist. The man is 34, at his age most players don't really give a feck, their legacy is set. He still applies himself like his 22. Not just a phenomenal footballer, phenomenal human. Unfortunately or fortunately, you are insufferable; you can also go to the messi thread where your other fanboys are. You have to be a self absorbed narcissist to be as good and as dedicated as he is to anything. A normal person can't be this bothered about being this much of a oeefoectioper. The man is 34, at his age most players don't really give a feck, their legacy is set. He still applies himself like his 22. Not just a phenomenal footballer, phenomenal human. I wish I was half as much of an oeefoectioper as Cristiano. Sometimes I feel a bit silly. Also had no idea google could index things so fast (except for news). I was wondering, if Ole was our manager in the summer and we had the feel-good factor in the club, would he have joined us? Recalled to the Portugal NT for the upcoming matches. Rested in the last 2 international breaks. No, he wanted to focus on getting settled in Italy I gather. Oh my fecking god that is brilliant. Patrice Evra has told told fellow pundits on ITV's 2018 FIFA World Cup podcast that if you are invited over to Cristiano Ronaldo's house, you should say no. The West Ham United defender, who played alongside Ronaldo at Old Trafford, told fellow guests on the broadcaster's podcast that he was left hugely unsatisfied after the invite, and that the Portuguese star was more keen to train than to eat. "He said, 'Patrice, come over after training.' I went. You know I was really tired, [and] at the table there was only salad and plain white chicken so I was like, okay - and water - not any juice," Evra said. "And we started eating and I was thinking some big meat would be coming after that but there was nothing." "He just finished and he stood up and he started playing with a ball, doing some skills and he said, 'Let's do some two-touch'." On the same podcast, Evra also recounted a tale of just how competitive Ronaldo is, even off the pitch, using a story about the time the Real Madrid forward lost a game of table tennis to former Manchester United centre-back Rio Ferdinand. "They were playing table tennis and Rio beat him and we were all screaming and Ronaldo was so upset," Evra revealed. "He trained for two weeks at home and he came back and he beat Rio in front of everyone. That’s Cristiano Ronaldo." Unfortunately you have to worry about him when the day comes for him to retire. What will he find to replace that. Bing translate said it’s Fat Thumbs for perfectionist. Think he's developed a lot in that area, judging by his behaviour on the pitch. He used to be very frustrated and grim on the pitch but he's not like that anymore, at least not to the same level. You have his occasional meltdowns like when he was sent off recently but apart from that there is far less lamenting, getting annoyed by team mates and overall egocentricity. When you compare him to his younger self you recognize he's changed a lot. Him not taking free kicks anymore, celebrating more when one of his team mates scores and simply being okay with not being the end of every attack of his team shows that, too. Guess the step to move from Madrid to Turin has also done quite a lot. He behaves differently at Juventus and seems be on much better terms with everyone. 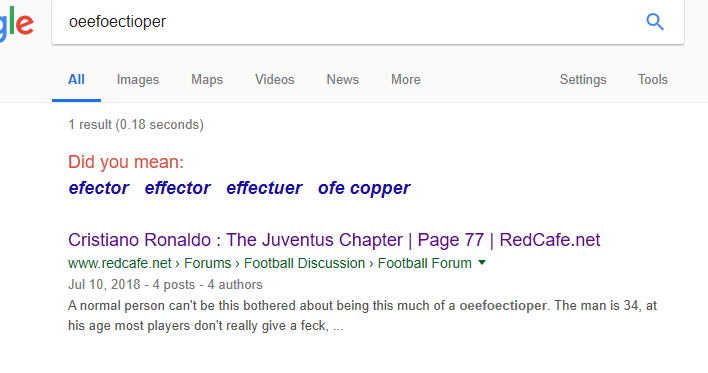 Is Ronaldo the greatest oeefoectioper of all time? Or is it Messi? We should have a thread. I've never been in those dressing rooms but it's easy to tell things work very differently in Madrid than they do in Turin. The politics inside the Madrid dressing room are more complex than anywhere else. It's always been a circus. I don't think the politics are a big deal when you are Ronaldo in Madrid and are pally with the other biggest players. Rather the press and fans that will get on your nerves, perhaps especially since he grew up professionally at United where he always got support from the fans. The Real Madrid stadium fans are far from the best fans you could have and the press loves to create drama. Anyone would be happier being rid of all that. True. Spanish media are horrible, didn't treat him fairly in the slightest. Not just him but most high profile non-spanish players. I actually think that Madrid fans being deemed as demanding and unfair is a direct result of the way the media scapegoats players and really attacks them in a way it doesn't really happen anywhere else. The Ronaldo that's been playing for Juve couldn't be further away from the egocentric primadonna Ronaldo that showed up often for Madrid, he geniunely seems happy there. I'm sure a big part of it is him getting older and being a father but the dressing room seems more together than in Madrid, the fans seem less bipolar than in Madrid and the media seems a lot fairer than in Madrid. I agree. He's really maturin. I think I mean more along the lines of what we will he find to dedicate his life to. When his life is no longer consumed by football what will he focus on. Sorry mate, knowing about registas and xG doesn't cut it these days. We've moved on to the next level. I think he’s got plenty of investments to keep an eye on and you can bet your life that he’ll work hard, even in retirement, to stay as fit as possible Not to mention a load of kids! Won't even travel to Genoa tomorrow, good decision. He'll play both games for Portugal in the international break and the league is won already so there's no point playing other than chasing records. I think he meant to write 'narcissist'. Think of it as the Caf's covfefe. @Adisa doesn’t make mistakes. This is code for something. Simeone got a €20k fine, so Ronaldo shouldn't get any more than that. So Ronaldo has literally been fined for doing nothing apart from making fun of a manager. Maybe UEFA are planning a jolly and need a few quid. Pathetic! If they fined Simeone, it'll be logical to do the same with Ronaldo to not be accused of bias. Hope he has something to show against the Ukrainians. €20K for the ball grabbing, no suspension. As expected.